Microsoft is a company with a plan as far as Skype is concerned, and apparently that plan is to get rid of the sprawl of existing Skype clients, instead producing one single app which works across all platforms. As you're probably aware if you use Skype at all, there's a rather messy range of different options in terms of clients which include the universal app for Windows 10 (which works across devices including Windows smartphones and the Xbox), the standard desktop app, Linux app, a web app, as well as Skype for Mac, and mobile apps for Android and iOS. All that's rather unsatisfactory for users who run a number of the above operating systems across different devices, and must cope with all these different apps, not to mention an unnecessary faff for Microsoft which must update, patch and maintain all these different pieces of software. Which is why one client that works across all these platforms makes sense, and according to Ars Technica, that's exactly what's in the works and currently going by the codename of 'Skype for Life'. This fresh cross-platform offering will work on all Windows devices, much as the universal app does now with Microsoft's newest OS, and also on macOS, Linux, along with Android and iOS. A truly universal app, in other words. And that far neater solution will sit alongside the offering aimed at companies, Skype for Business. Remember that this is just a rumour, though – but it certainly makes sense, and the source who spoke to Ars noted that the fact that all these multiple clients are being put on ice (going into 'maintenance mode', i.e. no longer being updated with new features) was part of the reasoning behind the recent job losses at Skype and closure of the London office. The report also notes that Microsoft is still working on Skype Teams, its incoming messaging service which is built to rival Slack and is very similar, but will branch off in some different directions such as having threaded conversations (i.e. replies to specific messages). 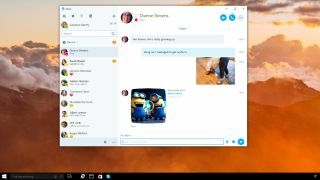 Meanwhile, work continues on building new features into Skype Preview on Windows 10, with the latest move being the reintroduction of the ability to send and receive text messages via your PC, with no need to reach for your phone at all. SMS and MMS messages will appear seamlessly alongside your usual Skype chats.